When you google charging healing crystals you will find a great deal of info that describes the same processes you use to cleanse healing crystals. These include; running them under water. Leaving them out in the moonlight. Leaving them out in the sunlight. Burying them in salt. And more. Each of these methods can be used to charge crystals, for sure. BUT, I prefer to use methods like this to cleanse my stones. For me crystal charging is a separate process. A crystal should definitely be cleansed before you infuse it with the intention of your choice. Once the cleansing process is complete, let the charging process begin. I recently started cleansing my crystals in bulk under the light of the full moon. I don't charge every one of them following this step. I charge those I know I will be using for spellwork throughout the upcoming moon cycle. If I need others for spellwork, and most often I do, then I give them a quick cleanse (usually under running water) and charge them for the purpose they will serve. I love the powerful magic that charged crystals bring to spellwork. I love to give charged crystals as gifts. AND I almost always carry a charged crystal with me, particularly at work. Charging a crystal is pretty basic stuff. Anyone can do it. And yet, the more you engage in this practice the more effective your work will become. It is, for sure, a skill to be mastered. And still, one that a beginner can perform with great results. 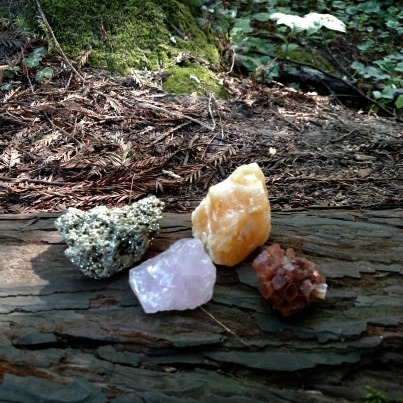 Using visualization and chanting to charge your healing stones is a very simple and common method. I used to use this method almost exclusively. It works quite well. Please don't mistake its simplicity to mean it is easy. It is physically, mentally, and spiritually draining indeed. To charge a crystal using this method, simply sit with it and visualize light pouring into the stone. Most often I visualize a bright white light. But on occasion I am led to visualize a color. Go with your gut on this one. This light is representative of the energy you want your stone to emit. Choosing a stone which is prone to the energy you are planning on charging it with, makes the process even more effective. For example; rose quartz is known to naturally emit a soothing and loving energy. So, choose it when you intend to charge it with this same purpose. Take your rose quartz and imagine a bright white light full of soothing, loving energy pouring into the stone. You can imagine it coming from the Earth to promote a grounding effect into the energy. Or the Sun to promote a passionate fiery effect into the energy. Or maybe a mountain stream to promote a cleansing, pure effect into the energy. Using this process boosts the energetic frequency that the stone already possesses. I still find this process to be the most effective way I know to charge crystals with specific intentions. It is very similar to spellwork. So, like spellwork it can be very taxing on the body, mind, and spirit. In other, words, it drains you. Be sure you have an easy day following your crystal charging session. Or do it at night when you will be laying down to rejuvenate yourself with sweet slumber soon after your session. There is another method I use to charge stones that is not as depleting as this one. I only use it when I am not in need of a particularly 'tailored' sort of energy in my stones. It usurps very little of my energy. AND is still very effective in its own right. I take my stones out in Nature. I choose a place which carries the energy I want my stone to possess. I choose a place where I feel my stones will be safe from outside influence and obviously from theft as well. I am fortunate to have the great and ancient redwood forests nearby. This is one of my very favorite places to leave my stones for charging. I also leave them in other wooded areas, in open fields, in a local apple orchard, and by the shores of the powerful pacific ocean. I love charging crystals using this method. It takes very little effort and works well. The stones will pick up energy from the atmosphere surrounding them, and then you can utilize that energy in your daily life or in your rituals. So easy. If none of these things are options for you, go ahead and create a special space just for this purpose. Cleanse an area suitable for charging your crystals and then fill it with items which carry the energy frequencies you want them to carry. They will pick it up. For sure. I have done this with plants, indoor and outdoor running water features, candlelight, and on a windowsill where a fresh crisp breeze is blowing in. Simply remember to give the stone your intention as you place it there and then reinforce that intention each time you pass by it throughout your day. Do remember that the energy your stones are absorbing using these alternate methods is not nearly as intense as the energy you infuse them with when you are physically present and actively participating in the task. Visualization and chanting create very specific frequencies for you to access later. Placing them in an area of choice is a bit more ambiguous, if you will. Find me on facebook and pinterest. May good fortune chase you throughout ALL of your days! May 4, 2018 Make Herbal Capsules ~ Use Mama Earth's Magic to Stay Healthy! Aug 23, 2017 9 Flower Teas - And Why You Should Drink Them! Apr 14, 2018 Make Your Own Laundry Detergent - Skip The Chemicals! Mar 12, 2018 St. Patrick's Day ~ What Are You Celebrating? Oct 29, 2017 Samhain ~ Celebrate it How?? Nov 6, 2017 Witchcraft ~ What is it Anyway? Apr 14, 2018 Polenta & Paradise - Perhaps the Same Thing! Information on this website is of a general and educational nature. It is not intended as a substitute for medical care from a licensed professional. AncientAllies.blog and/or it's proprietor does not claim that it is fit to meet your mental, physical, or emotional needs. You retain sole responsibility for your healthcare choices and daily practices.